I think this little tea bag holder that can sit right on your counter is a perfect gift for a tea-drinking friend. They can use the tea bag and slip another one into the now-empty envelope. It's one of those gifts you give someone, and you know every time they open it and grab a tea bag, they are thinking of you! This is the view of the box open. 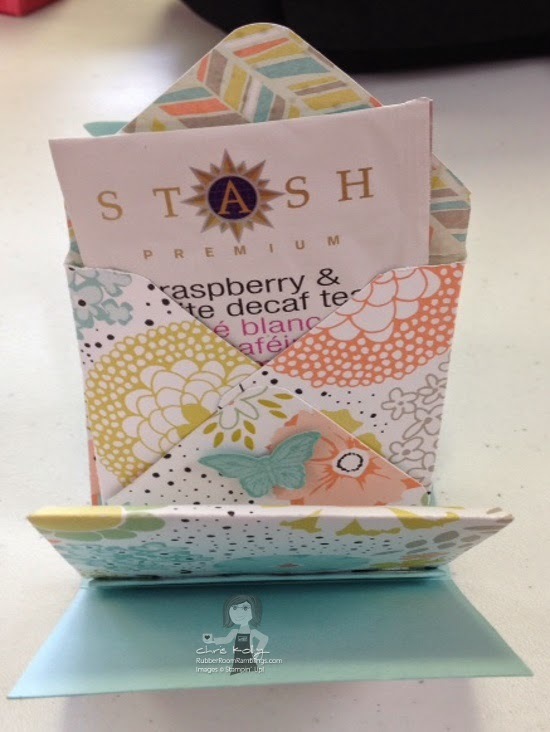 There are four envelopes inside, so it will hold four tea bags. Each envelope is made with the Envelope Punch Board. It was really simple to decorate just using my SU! 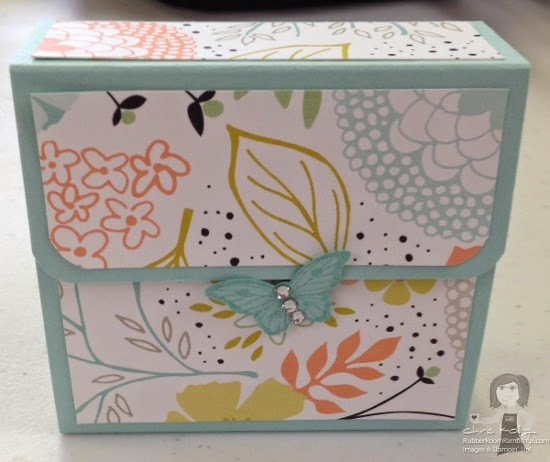 Butterfly Punch and attaching it to the front of the box with a dimensional at the bottom. The dimensional placement allowed me to slip the cover of the box right under the top of the butterfly and close it. The design for this box came from Sam Donald. I had to switch her dimensions up, as my tea bags were a slightly different size. For my box the piece of the card stock for the box is 10" x 3 1/4"; scored at 3", 4 1/4", 7 1/4" and 8 1/2". The inner piece (which you adhere the envelopes to) is 4" x 3", scored every 1/2"
The envelopes are made with the Envelope Punch Board and are 5 x 5" . Score & punch your 5 x 5 piece at 2 3/8"; turn your DSP 90 degrees, line up the scored line you just made with the score guide, punch & score; repeat this process on all four sides.